State Sen. Joseph Cervantes, D-Las Cruces, is seeking the Democratic nomination for governor of New Mexico. The lawyer and small businessman talked with NMID about his plans for education and child wellbeing in New Mexico. New Mexico In Depth is speaking with the candidates for New Mexico governor on the issues of early childhood, child wellbeing and education in New Mexico. State Sen. Joseph Cervantes of Las Cruces is one of three candidates seeking the Democratic nomination. He is a lawyer and small business owner in southern New Mexico. This Q&A has been edited for length and clarity. Sylvia Ulloa: What would early childhood education in New Mexico look like in a Cervantes administration? Joe Cervantes: I recognized from my years working on the budget and with the Land Grant Permanent Fund that funds are dedicated to education, and I have supported and actually introduced legislation to use the Land Grant Permanent Funds for early childhood education, so I support that initiative. The reality is, we’d have to put in infrastructure that builds on the existing infrastructure because we’re talking about quite a bit more money. We have proven results from things like K-3 Plus, which adds more days to the school calendar for children who are the most vulnerable in our state. We need to expand on programs that work, and then we need to get into the households of families who need state assistance in the early years of raising families. SU: You haven’t had to vote on a Land Grant bill in the Senate because it has never gotten out of committee there. So, what kind of bill would you support? JC: (The bills don’t advance) not because there’s opposition to the idea; it’s in the details. Look, the reason (the state permanent funds are worth) $23 billion is because they’ve been invested over the years and protected by a lot of people. Can it afford to see more of a distribution? Yes, it can. How much more becomes the issue and for how long, and for what purpose. I think what’s important for folks to realize is that it gets held up in the committee process for a reason. The difference I will make as a governor is that I’ll have the relationships with the people on those committees, both in the House, Patty Lundstrom, and the Senate, John Arthur Smith, and their committee members. I think they’ll trust me to make sure that we’re accountable for those monies and they’re well spent. SU: Under the Trump administration, there has been a shift to cut social safety net programs such as SNAP. They’re talking about taking $20 billion out of that fund and putting in work requirements for Medicaid. As governor, if those things came to pass, how would you deal with that? JC: The next governor is going to inherit a federal government that is antagonistic to a lot of things that are important to New Mexicans. The federal government, for example, is talking about cutting back to not only the SNAP program, but to Medicaid funding and many other things that are important to our infrastructure. The next governor is going to have to deal with that as a challenge, and that’s going to mean going to New Mexicans and telling them, look, the federal government is putting us in this position and we’re going to have to respond to that because the needs of New Mexicans are dependent on health insurance, on funding for some of our families that are in greatest need. And the alternative is not to just cut these families off. SU: One of the biggest predictors of educational outcomes is income level: In New Mexico, 30 percent of children live in poverty, 17 percent suffer food insecurity and more than a third have parents without secure full-time employment. As governor, what would you do to change some of those grim statistics? JC: Ultimately, we’ve got to make the job opportunities greater for families in New Mexico. We’ve got to improve wages, we’ve got to keep families here, make them successful in their career choices, educate more children who are prepared for the jobs that are available in our state, and high paying jobs — even if they’re not necessarily college track. It’s about opportunities. That starts with education in the long term, but in the short-term, we’ve got to put New Mexicans to work by improving the efficiency by which the state spends money. SU: Can you give me an example? JC: The best example is capital outlay. We have about a billion dollars that is already committed to projects around the state. The money’s already been bonded on Wall Street; we’re paying interest on that money. We’ve got projects that are committed, but they’re not going to work, they’re not creating jobs. The reason for that is a breakdown between local government, and legislators and the governor. Everybody funds their own project in their own small part of the state rather than us coming together collaboratively and putting together the big, important projects that are ready to go right now. If we did that, there’d be a billion dollars worth of construction going on in New Mexico today. Sen. Joseph Cervantes visits with teachers during National Teacher Appreciation Day on May 8. SU: Another huge indicator of educational attainment and success in life is Adverse Childhood Experiences, things like child abuse, domestic violence, parental substance abuse. We have awful examples of child abuse, just recently up in Nambe, and here in Dona Ana County with Baby Brianna. Do you think the changes being made at the Children, Youth and Families Department are headed in the right direction? Would you do something differently? JC: I’d do things very differently. Children Youth and Families has not risen to the task — and it’s an enormous task — but we’ve got to have people that are going to address it. We (had an example) just last week where a young child was being prostituted by her parents. CYFD had been called on that child 24 times. We’ve had children who have been subjected to brutalizing abuse, torture, deaths, and in most cases the state had warnings of those children in trouble, those families in crisis, and the state just didn’t respond quickly enough and in an appropriate way. The reason for that, very simply, is those budgets and those agencies have been cut to the bone. The thinking is that by not raising taxes, by keeping budgets lean, that we’ve accomplished something, and that’s cost children’s lives in our state and tragedies that are not an acceptable trade-off for a pledge not to raise taxes. SU: CYFD did get about $25 million more this legislative session to add case workers and for child care assistance, which keeps kids in safe environments, so they’ve made some movement. JC: Well, that’s good news to report, but that increase came simply because oil and gas prices rose again. We can’t base our budget and the way we conduct ourselves as a state, up and down, as oil revenues come and go. When oil revenues are down, as it has been over the last several years, we can’t throw our kids over the side of the boat and say we don’t have the resources to meet their needs during those periods, and then say, now oil and gas prices are back up, we can meet your needs this year. That’s no way to run a state and, frankly, the cost of children’s lives, the danger, the torture, the abuse are not things that should ever be a trade-off. We’ve got to make sure that we have revenues in place to assure those services are available year after year. SU: Your platform calls for an end to high-stakes testing and evaluating schools and teachers based on kids’ standardized test scores. So, what would you put in their place? How would your Public Education Department (PED) maintain accountability and improve results when you have 77 percent of fourth-graders not proficient in reading and almost 80 percent of 8th graders who are not proficient in math? JC: Jennifer and I have raised our three daughter here in our local school district in Las Cruces, and my daughters have had every opportunity — any college, any degree, any program. The difference is that not all New Mexico children are receiving the same opportunities. We’ve got to find a way to change the attitude toward our public schools. This administration has demonized teachers — made them the source of all of our state’s problems on education. This governor appointed a secretary of education who became antagonistic from the very beginning with teachers. So what do we do with education? We re-establish partnerships with teachers. We make teachers happy to come to work. We don’t continue basing their compensation on how their students do on standardized tests. My daughters, who did well in public schools, didn’t get a chance to learn history, civics, geography. Why? Because those aren’t on the standardized tests. That’s not the type of comprehensive education we need to provide our students here. We do need to test students, but we shouldn’t be administering things like the PARCC test simply because the secretary of education is on the board of the people that sell that test. SU: In a recent forum in Las Cruces, you mentioned the lawsuit against the PED over underfunding education in New Mexico. If the ruling goes against the state, as governor, how would you deal with that? JC: Here’s the thing, we shouldn’t be in a lawsuit, having the educators in our state suing the state for underfunding our schools. As governor, I’ll resolve that lawsuit without having to wait on a court and a judge to decide that, and we’ll take control of this matter for ourselves. A governor who’s a true leader will sit down with educators, sit down with administrators, superintendents and school districts and find out where we have the resources, where we need to generate additional resources to those schools, and then make sure that we solve these lawsuits rather than rolling the dice in court. It’s the wrong approach, whether it’s water, whether it’s education. SU: But how would you address the education gap that Native American students, English language learners, and poor students, in particular, have with middle-class students? JC: We need to recognize that it is not going to be about just putting more money into the system. There are limitations on where we’ll be able to do that, No. 1. And No. 2, we need to recognize the problem is much bigger than that. The achievement gap between Native Americans, Hispanics and other students is not a factor of funding alone because we have an equalization guarantee in New Mexico. We make sure school districts are, in theory, funded equally across the state, so that no wealthier districts get a disproportionate share of the revenues, but we need to recognize that the achievement gap exists. And we also need to know that as a state we’re going to have to bridge that achievement gap if we’re going to make any progress in bringing employers to our state and keeping our young people here. SU: Policy-wise, do you have thoughts on how you might do that? JC: I do. And the good example would be here in the Gadsden school district, in my own district. (It) has a very high Hispanic population where incomes are not strong, and yet they show some of the greatest improvements on achievement in test scores. It comes down to leadership. Those schools have active and involved parents, an engaged principal and superintendent, people who are reaching out into the community and trying to make this a bigger community-wide issue rather than just believing that if we spend more money that will solve the problem. The idea of this administration is too simplistic. Test students, spend or don’t spend money, and leave it at that. We need to go out and get parents involved, and have them involved in their children’s lives. That’s how we bridge the achievement gap. SU: Is there anything else you’d like to say? JC: I’ve lived my life here in New Mexico. I’ve attended college here. We built our businesses here. We’ve been fortunate to see a lot of success, and so I want to make sure that all New Mexicans have that same opportunity. New Mexico serves a very small group of people very well: the people that are connected in our state. I want to be a candidate for governor who will be straight with them, who will be able to show the experience that we haven’t had for 44 years and seven administration, who have never come into the governor’s office with the proper background out of the Legislature. And then, frankly, somebody who has the courage to do the right thing. You can find his policy positions here. Disclaimer: NMID did not fact check every statement made by candidates in these interviews. 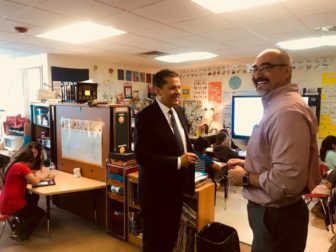 New Mexico In Depth is speaking with the candidates for New Mexico governor on the issues of early childhood, child wellbeing and education in New Mexico. 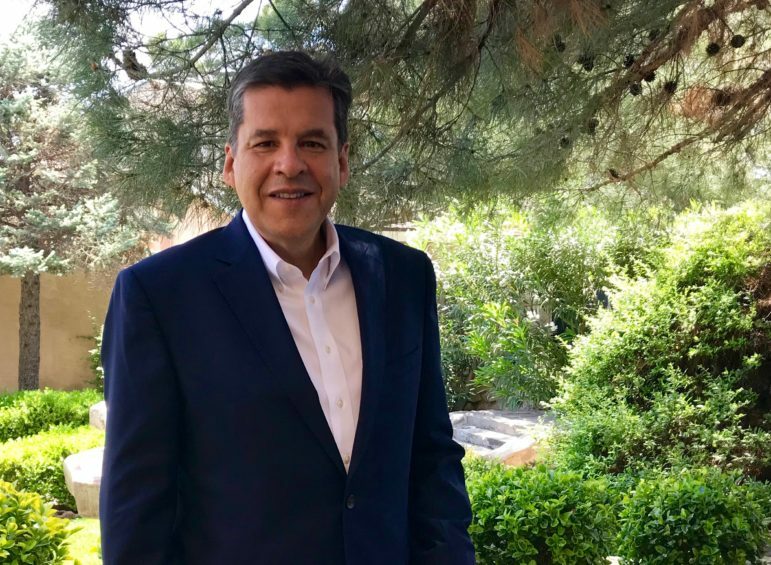 Jeff Apodaca of Albuquerque is a former media executive and is one of three candidates seeking the Democratic nomination.